If you use a breadboard for quite a lot to develop and prototype your microcontroller’s based project than you will realize that we repeatedly use the LED to display the microcontroller’s port status. With more LED and its current limiter resistor being added to the breadboard, soon it will occupied our breadboard space very quickly, especially if we use small breadboard for prototyping; not to mention the wire we have to make for this LED and its resistor. 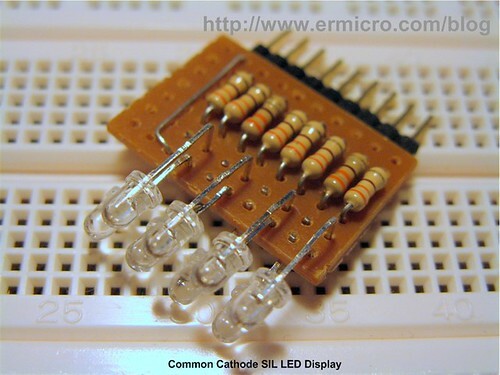 Now take a look at this neat SIL (single in line) common cathode LED display bellow, which you can easily build using 25 mm x 20 mm prototype board, eight 3 mm LED, eight 330 Ohm 0.25 watt resistors and one 9-pin header connector, which is suitable for most of the microcontroller’s based project and the best of all its require minimum breadboard space and wiring. You could easily change to the common anode (CA) by reversing the LED anode and cathode polarity as shown on this following schema. 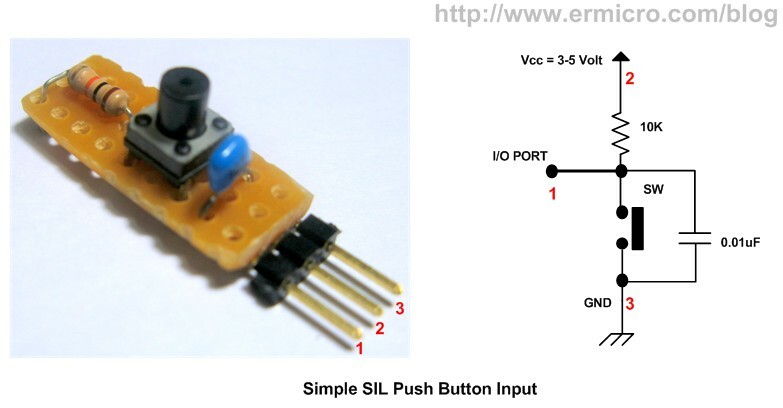 The SIL push button input module could be use as the RESET switch or as simply as the one bit digital input to your microcontroller project. Now as you see the advantages of using the SIL LED output display and SIL push button, let’s make your solder hot and build these useful quick prototyping modules.